Boinc-client 7.0.28 and uploading problem to http://worldcommunitygrid.org ! Message boards : Questions and problems : Boinc-client 7.0.28 and uploading problem to http://worldcommunitygrid.org ! 16-Oct-2012 14:34:14 [http://www.worldcommunitygrid.org/] Sending scheduler request: Project initialization. but my boinc-client don't upload it to worldcommeunitygrid.org! 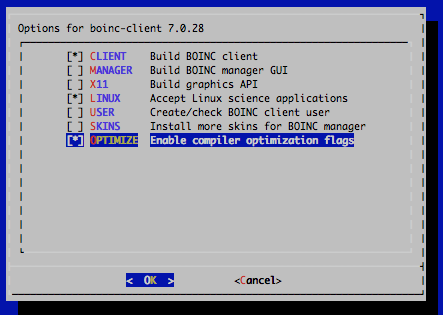 later (before) updating i use boinc-client-6.4.5_7 and don't have a problem! Message 46032 - Posted: 18 Oct 2012, 8:09:41 UTC - in response to Message 46031. And what do the good people at the World Community Grid forums say about it? Can you also please post the contents of the global_prefs.xml file and if it exists the contents of the global_prefs_override.xml file? Also check what your Network activity setting is set to. Message 46036 - Posted: 18 Oct 2012, 12:09:18 UTC - in response to Message 46034. Message 46052 - Posted: 19 Oct 2012, 16:50:57 UTC - in response to Message 46036. Those look normal. So what do they say about it at WCG? Just in case someone comes across this thread. I am overcoming this issue by simply going to my projects tab. Selecting "World Community Grid" and then clicking the "UPDATE" button. This seems to both clear out the Task tab of "ready to report" jobs and initiate transfer of jobs sitting on the Transfer Tab. Message 47590 - Posted: 31 Jan 2013, 11:20:54 UTC - in response to Message 47589.
the solution is to have the 'Additional' Cache setting set to a very low value, then Boinc will ask more often. Message 47592 - Posted: 31 Jan 2013, 12:32:12 UTC - in response to Message 47590. Maybe something is not resolved? Where's the www. prefix to worldcommunitygrid.org? For WCG support, turn to WCG forums. We'll await your call and who knows, has it anything to do with the major out there was on Tuesday, the 29th.